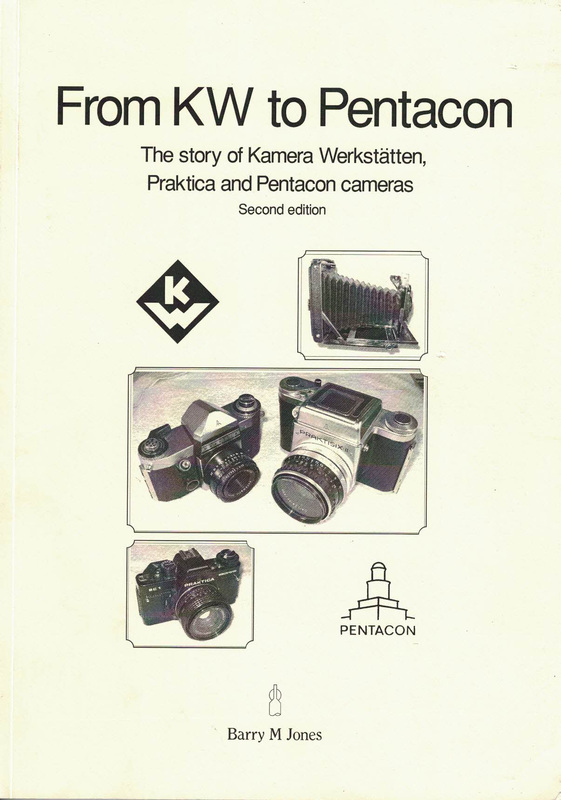 This new book is the first detailed history in English of KW, Praktica and Pentacon cameras. Their story begins in Dresden, Germany before the Great War with Paul Guthe's pioneering, patented truly compact folding camera, the Patent-Etui, which finally entered production at the end of the war in partnership with Benno Thorsch as Kamera Werkstatten Guthe und Thorsch: or 'KW' for short. 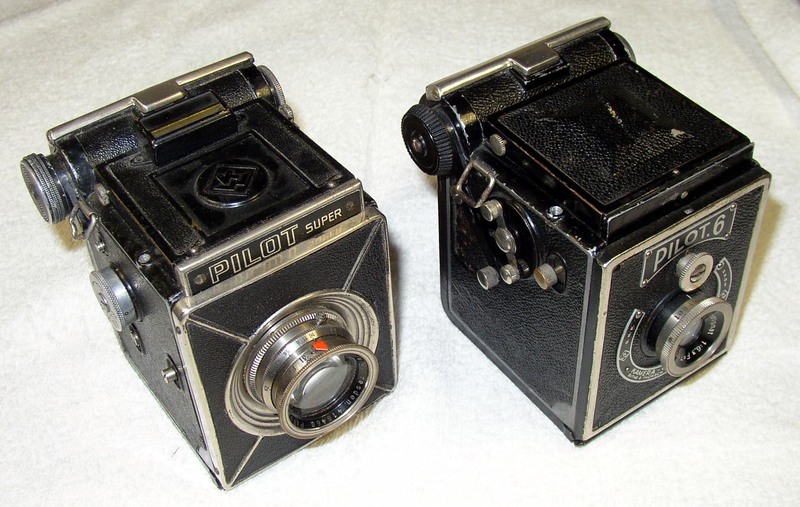 The Patent-Etui was an instant success and was soon joined by an equally novel and compact twin-lens reflex, the Pilot TLR. However the deepening depression in post-war Germany brought the need for basic box cameras. First was the primitive Reflex box 6x9cm, followed by the equally primitive Pilot 6 6x6cm and, just before the war, the Pilot 6 Super with interchangeable screw-fit lenses. 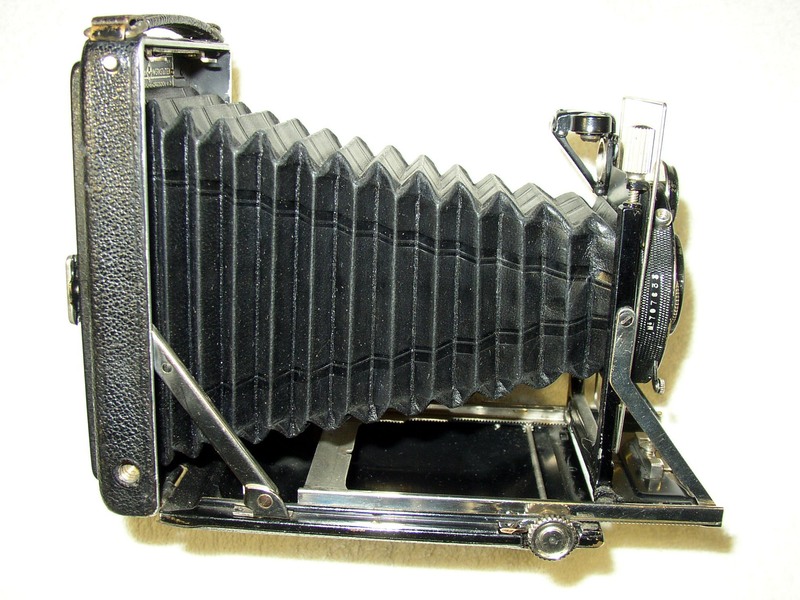 In 1936, Ihagee of Dresden launched their Kine Exakta 35mm SLR which prompted Benno Thorsch to invest in a new 35mm SLR, co-designed with Alois Hoheisel but the growing unease with anti-Semitism in Hitler's Germany led Benno to eagerly exchange his business in 1938 with the photographic processing business in Detroit of a visiting American, Charles Noble. Safe in America, Benno grew that business while Charles Noble pressed the new 35mm SLR into production as the 'Praktiflex' - the world's third 35mm SLR. 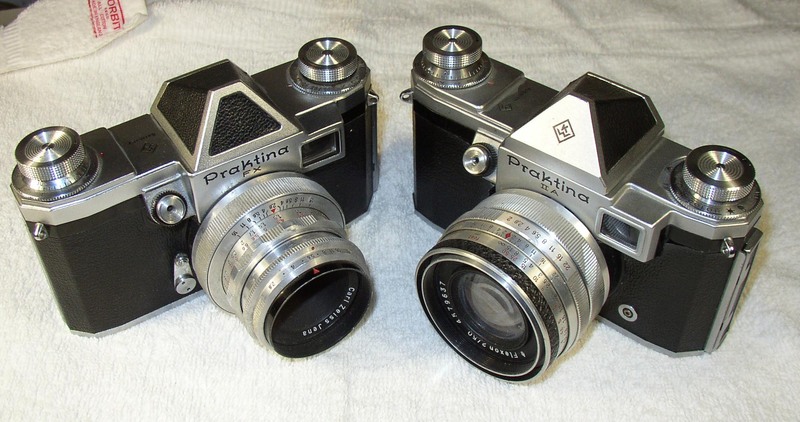 No sooner had the Praktiflex entered production than war was declared. 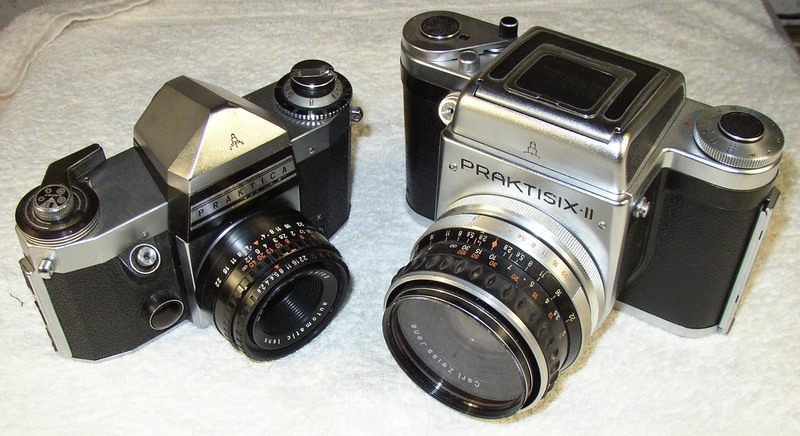 However as a neutral, American-owned business, barred from producing munitions, the KW Praktiflex remained in production and development despite America entering the war in 1942, whereas camera production at Zeiss Ikon's and the Dutch-owned Ihagee's Exakta factories dramatically declined. Through war-time fate, Dresden fell to the Russians and KW came under direct Soviet Military administration; the Nobles were arrested without charge and imprisoned for several years. Into their shoes came Siegfried Bohm, a young Zeiss Ikon engineer 'volunteered' by the Russians to get KW back into production while Zeiss Ikon's Dresden (and later Carl Zeiss' Jena lens) production machinery, camera and lens technology was transshipped to Russia as war reparations to emerge as FED, Zorki and Zenith copies. 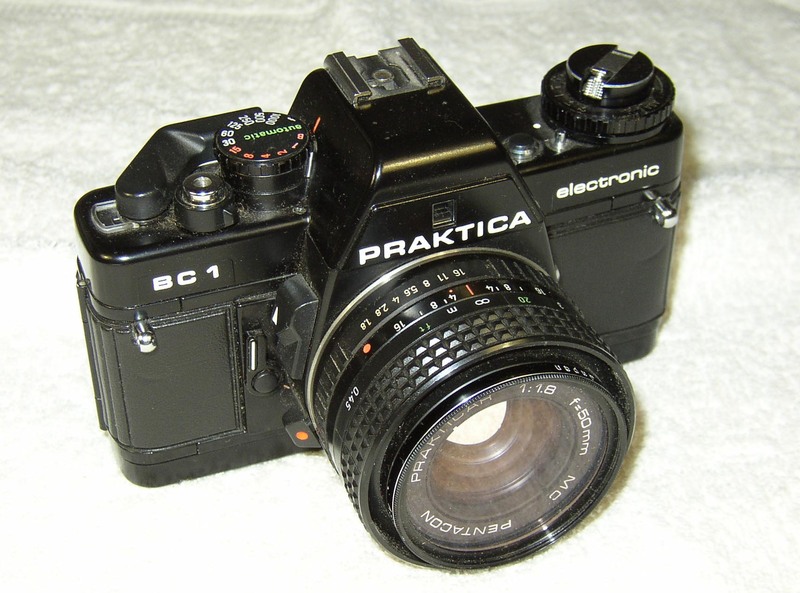 Bohm launched an improved camera in 1949, the 'Praktica' which introduced the 42mm lens mount and... well the rest is history as a succession of new Praktica models followed: Praktica FX, IV, V, Nova, L-Series and finally the advanced electronic B-series of the 1980s which finally gave the Praktica brand world-wide acceptance as high-class camera makers, long denied as a sneer against communism. The heavy state subsidies for export markets made Prakticas incredible value for money, launching many photographers into a professional career. Bohm's greatest success however was his Praktina 35mm system camera of 1952 - the world's first - with motor drive, bulk film back, bayonet-mount interchangeable lenses. It was a stunner then and is still a very highly regarded working camera to this day. Their next system camera was the short lived Pentacon Super - a very advanced camera built to the highest engineering standards primarily for scientific work; indeed it and the Praktisix 6x6 were used in Soviet space missions. Under the socialists' economic planning regime, Dresden's camera and lens makers were systematically merged. Zeiss Ikon's Contax S SLR and certain other camera designs passed to KW while a new VEB Pentacon business was formed in 1959 finally absorbing Beier, Certo and other smaller businesses making compact camera. Among Pentacon compacts were the Penti, Prakti and Electra with electronic shutter, and cine cameras. Then in 1985 VEB Pentacon and VEB Carl Zeiss Jena merged and became one of East Germany's most important engineering businesses of world class standing. Unusually, they launched a range of modern 'SPORT' compact cameras and binoculars made for them in Japan. The collapse of communism and the fall of the Berlin Wall in 1989 saw Pentacon, now without government subsidies and military contracts, facing certain closure - that came in 1990. The camera side was saved at the last minute by Heinrich Mandermann as part of his Schneider lens group, while the future of Pentacon's extensive work in microfilm, film processing and imaging technology lay in the balance until reunification of East and West Germany when the VEB Pentacon and Carl Zeiss Kombinat group was broken up. Reunification saw Carl Zeiss Jena (East Germany) and Carl Zeiss Oberkochen (West) finally reunited but much of Jena's work was sold off and became the independent Jenoptik GmbH now a direct competitor to both Zeiss and Pentacon! The Nobles finally recovered their lawful properties and launched their novel Noblex camera, but their new KW business in the old KW factory soon folded. Although Pentacon very briefly continued to make B-series and 6x6 Praktica cameras (the latter marketed as an Exakta) and developed digital imaging technology, all their cameras and binoculars are now made in the Far East. This book describes every KW, Praktica and Pentacon camera (the author has used and owned (nearly) every one over 40 odd years!) and describes those from other Dresden companies marketed as KW/Pentacon models. It also relates the group's resurrection post-reunification, bringing the vintage camera collector up to date. It draws on the author's long held regard for the marque as well as the acclaimed German-text histories such as Hummel's and Jehmlich's but it is emphatically not a translation of these! "From KW to Pentacon - (The Praktica story)"